Background The Pearlscale is a native Chinese goldfish that was imported to Japan in the late 1950s. It is not known how they came to exist. They are named ‘Chinshurin’ in Japan because their name written in Chinese characters reads as ‘Chinshurin’ in Japanese. It most likely means a goldfish that has scales like rare pearls. It has become common of late that they are called the ‘Pearl’ or the ‘Ping-Pong Pearl’. 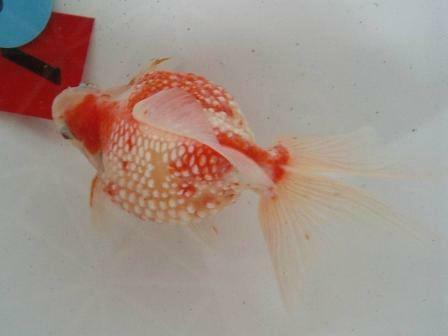 Features As its name suggests, this goldfish has pearl scales as its feature. In the early days it appeared on the market, there were some Pearlscales that had a longer body shape, like a long Ryukin. However, round-bodied ‘Ping-Pong Pearl’ Pearlscales have become more popular in recent years, particularly among women. Acquisition difficulties Normal. They have a cute, round body are popular, so they can be found at places like home centers. Rearing difficulties Normal. Although the Pearlscale has a different body shape to other goldfish, there are no particular challenges in rearing. However, they have a higher risk of overturning as they grow if they have a rounder body than normal. Details of the above photo The Pearlscale in the picture is the goldfish that won first prize in the Pearlscale section at the 2005 Japanese Goldfish Convention. Other People have different tastes when it comes to the unique pearl scales.